It's pumpkin carving time! 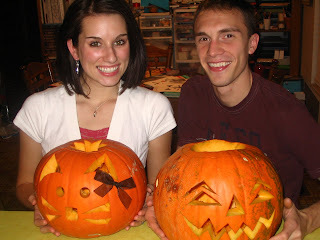 We carved pumpkins a little late this year and had a really hard time finding pumpkins. We finally found some at Harmons. They only had ten left but we found two that were just right. I hate pulling out the guts, but that's why this year is different because I have Jacob to pull out the guts for me! 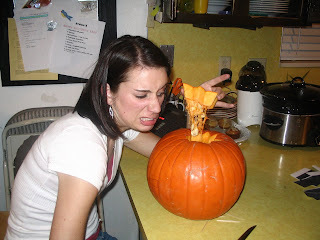 I must say, there are a lot of pumpkin ideas online. I saw one website that had presidential candidates faces on pumpkins. Oh the things people do with free time. 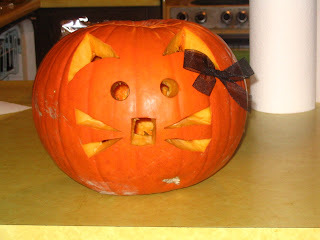 Here are some pictures of our pumpkins, a scary face and a kitty. Yes, I did add a little bow. Happy Halloween! When did you cut your hair? I love it! You and Jacob are such a cute couple--gotta love the Eagle for bringing everyone together, haha! you cut your hair short and didn't even tell me!!!!!!!!!!!! You did not tell me either!! Its so cute!